Immensely lively, incredibly sparkling, unheated, Ceylon "diamond" pink sapphire. Delightful. Diamond-like, exciting luster, perfectly shaped, unheated, Ceylon, faint yellow sapphire. Gorgeous! Very crispy and crystalline, this unheated, Ceylon fancy sapphire weights 1.36 cts., pastel, (v.light tone) yellowish color with perhaps the faintest of greenish undertone, perfectly executed, "antique" cushion, mixed cut 7.5x5.62x3.42mm, flawless gem, IF-VVS1 from the gem fields of Balangoda, Sri Lanka. The crispness and ethereal light emanating from this sapphire is hardly captured by the pic. Simply a very beautiful, no heat, Ceylon sapphire that is well cut, flawless and with an interesting & unique, very light yellowish hue. Easily mistaken at first sight for a light yellow diamond. See it in real life to understand these words. Very, very lovely sapphire. The best good looking, unheated, Ceylon yellow and pink pair set. Exotically charming. 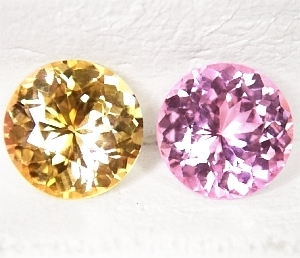 A gorgeously shimmering and identical in cut and diameter, unheated, Ceylon yellow and pink sapphire pair set, weighting 1.84 cts. 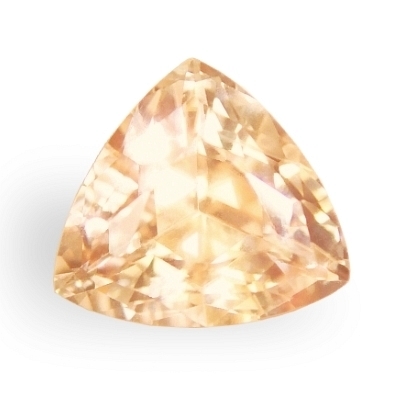 total weight, pure yellow-light golden and pink colors, perfectly executed, round, modified, diamond cut, measuring 6mm each (will mount perfectly a calibrated setting of 6mm! ), eye flawless, VVS to VS type2 from the gem fields of Ratnapura, Sri Lanka. Here is an opportunity to own an alluring set of unheated sapphires with very lovely color, clean and well cut, for that ideal whatever your heart desire. A nice bypass ring, or a unique pendant...well, ...but do not delay. Really gorgeous!! Diamond-like, ultra shimmering, unheated, 3-gems, Burmese sapphires set. Uniquely cut. A brilliant, rare and unique set of unheated sapphires from Burma. This set weights 2.05 cts. 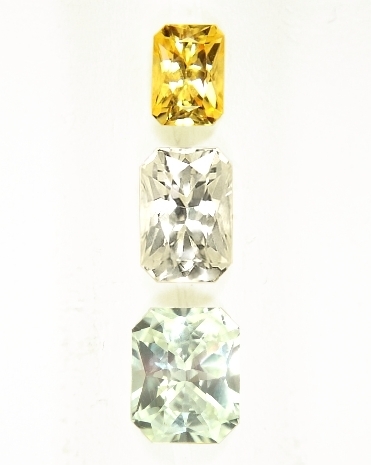 total, a combination of yellow-gold on top, white-faint yellow the middle one and a greenish-yellowish the bottom one, masterly executed in a rare, emerald, radiant, mixed cut, from 4.6x3.3mm graduating to 6.1x4.8mm, all flawless IF-VVS type2 from the gem fields of Mogok, Upper Burma. Unheated Burmese, pastel shades sapphires have a very distinct and brilliant light that make them very unique and sought after. In addition to the rarity of their provenience, they are perfectly cut in an emerald, radiant shape. Just a gorgeous and unique set, very well priced too. Have us design and craft a journey pendant for you.... ask for it. Very rare, incredibly brilliant, great size, unheated, "padparadscha", Ceylon sapphire. Captivating gem. We specialize in natural colors, not heated, Sri Lankan sapphire and we purchase directly at the mines in Ratnapura, Marapana, Nivitigala, Pelmadulla, and Elahera. This one is a great sapphire at a very affordable price for this quality and size. 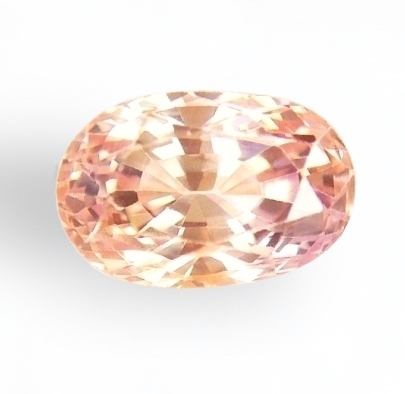 It weights a great 1.63 ct., pastel, pink color with v.slightly orangish undertones (Padparadscha), excellent, oval, mixed cut, measuring 7.23x6x4.49mm, eye flawless, VVS to VS type2 from the gem fields of Pelmadulla, Sri Lanka. 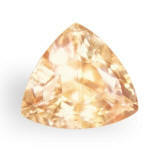 Great light, dancing shimmer, this padparadscha is what you want if you are looking for rarity, fashion and a pink diamond-like, lustrous gem. Very, very under priced for this unheated quality. Appraised for $5,705 (appraisal include with purchase). 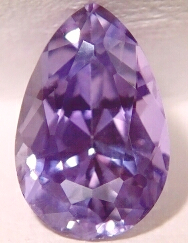 Perfect pear shape for pendant, rare & unique, unheated, violet Ceylon sapphire. No reserve! I love this pear shape, ready to make a most desirable pendant. This unique, unheated Ceylon sapphire weights 1.72 ct., pure, mid violet color, excellent, pear mixed cut, measures 9x5.88x4.18mm deep, eye flawless, VS type2 from the gem fields of Nivitigala. 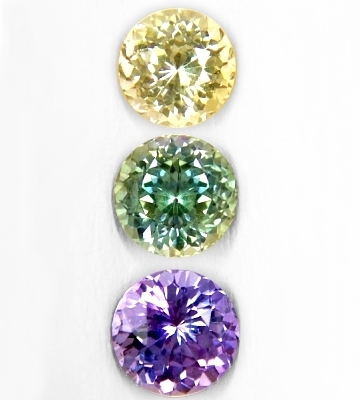 We purchased a large parcel of these unheated fancy colors sapphires, and we make them available at a great price. They make good looking and exotic center pieces at a very affordable price. This is an alluring example at a price that is unheard of for an unheated, Ceylon sapphire. 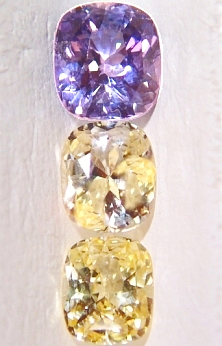 Unheated Violet colored sapphire is difficult to obtain and surely it is a delight to experience! 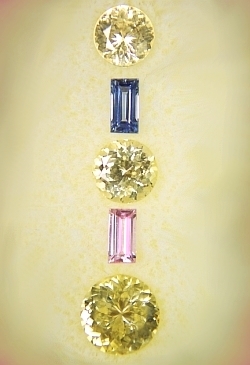 Unheated, Ceylon fancy sapphires, 3-gems set. So gorgeous...very affordable! Lovely! A beautiful set of three, unheated, Ceylon, fancy sapphires, weighting 2.13 cts. total weight. 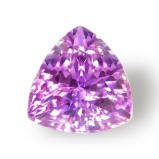 The identical, "antique, Ceylon cushion" cuts that graduate from a violet sapphire 5.9x5.2mm, to a 5.6x4.7mm. 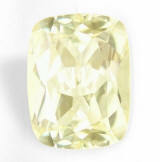 light yellow in the middle to finish with a 5.25x4.4 medium yellow sapphire. Ideal for a 3-gems pendant (journey pendant), these will enliven your day without any doubt. Unheated-untreated, very well cut and with flawless clarity, very rare and...delightful. Brilliantly unique, completely adorable, unheated, Ceylon orange "fancy" sapphire. Superbly cut...rare color. 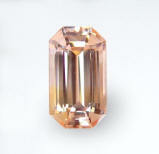 A vivacious, unheated, Ceylon sapphire weighting 1.57 ct., unique, pastel orange-champagne color, perfectly executed, trillion, mixed cut, measures 7x7.75x4.1mm, flawless, IF-VVS type2 from the gem fields of Ratnapura, Sri Lanka. Trillion cuts seem to have a special, mystical energy. Associated with perfect brilliance, make them very uniquely intriguing and fascinating. This one has all the cards there... At a great price...actually at a give-away price! Magical, incredibly scintillating, unheated, Ceylon, "fancy" sapphires, 3-gems pendant set. No reserve! Such a gorgeous set, ideal for that 3-gems, journey pendant you have been dreaming of. With a 2.53 cts. total weight, these, unheated Ceylon, fancy sapphires are a delight to experience. 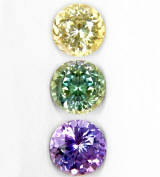 All having the same, round, modified, diamond, mixed cut, at 5.25mm in diameter the yellow, 5.5mm the mint green, and 5.7mm the violet sapphire. All clean, VVS type2 clarity, all gorgeously cut, and all natural in colors without any heat or treatments of any sort. Do not hesitate on this set, simply because it is truly beautiful! Email us and we will set this gorgeous set for you. 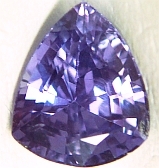 Certified unheated, violet-purple, Ceylon "fancy" sapphire. Magnificently brilliant, exuding beauty. A rare and a most amazing color, certified unheated, Ceylon "fancy" sapphire weighting 1.664 cts., medium, intense, violet-purple color (even though on the cert it is named "violet"), changing to medium, purplish-pink in incandescent light (color change 90%), perfectly executed, trillion, mixed cut, measures 7.21x6.88x4.55mm, eye flawless, VVS to VS type2 from the gem fields of Elahera, Sri Lanka. 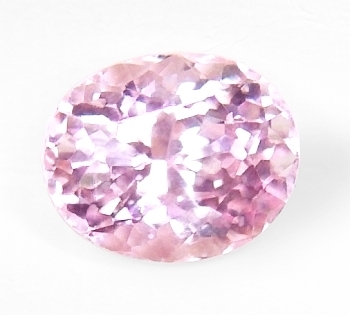 A truly gorgeous and scintillating sapphire with a strong color change to the sought after pink in incandescent light, makes this certified unheated, Ceylon sapphire a gorgeous candidate for that special piece of jewelry. Independently certified by the Lakshani Gem Testing Lab from Colombo, Sri Lanka as unheated. $150 value cert included. Amazingly pure, uniquely cut, truly spell-binding, Ceylon, orange "padparadscha" sapphire. Flawless. From our last trip to Sri Lanka, comes this amazing, pastel, orange "padparadscha" sapphire, weighting 1.52 ct., medium, intense orange with v.slightly pinkish undertones, perfectly executed, master, elongated emerald, step cut, measuring 8.91x4.93.44mm, flawless gem, IF-VVS type2 from the gem fields of Ratnapura, Sri Lanka. We purchased the rough at an auction in Marapana area, Sri Lanka and we cut it according to the elongated shape of the crystal. A very gentle, low heat of 1/2 hour, using the ancient method of local pipe blowing has been applied to remove the hint of silk that was localized in one part of the stone. Then we cut it. A lustrous and flawless sapphire that has to be seen to be believed! A gift! 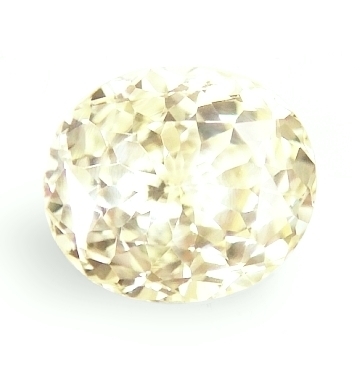 Absolutely lustrous, like a light bulb, unheated, Ceylon "fancy", faint yellow colored sapphire. Perfect cut. What a sparkling sapphire! See it in real life and you will agree about the pic not doing any justice to it at all. 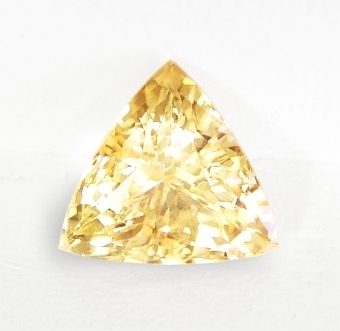 This unheated, Ceylon "fancy" weights 2.00 cts., faint "buttery yellow or white "tinted yellow", masterly & perfectly executed, oval, "flower" cut, and measuring 7.93x6.88x4.34mm, eye flawless, VVS2 from the gem fields of Marapana, Sri Lanka. If you like supreme luster and a good size sapphire, there is nothing better than this one. Yes, the color is in between a white and a yellow, an hybrid perhaps?, if you want to call it so, (that is why the price is so appealing), but the perfection of cut and final eye appeal & presence is simply spell-binding. Beautiful, beautiful unheated sapphire at an incredible low price. .
Uniquely gorgeous! 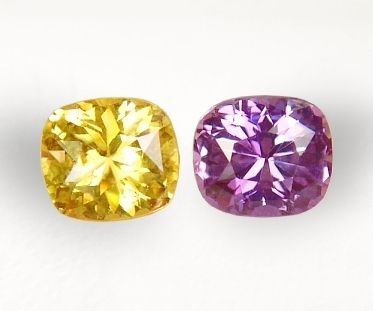 Pair of unheated golden and pink-purple, Ceylon, "fancy" sapphires. Great pair! Fabulous pair on unheated, Ceylon fancy sapphires. This couple weights 1.62 cts. total weight, one is a strong, finest golden color (yes, no heat!) and the other is a medium pink-purple color. Both of them have an identical, "antique, Ceylon cushion" cut, that measures 5.7x5mm, both are eye flawless, VVS type2 from the gem fields of Ratnapura. A real dazzling unheated pair of fine colors. You can set them anyway you like, perhaps two identical band-like rings, one for him and one for her, that just became engaged. Whatever your creative use, they are guaranteed to enlighten your life...always! Very well priced too! 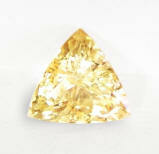 Blindly lustrous, mystically shaped, awesome, unheated, Ceylon orangish-yellow sapphire. A give away! A stunningly lustrous unheated, Ceylon sapphire weighting 1.0 cts., lively, pastel orangish-yellow color, perfectly executed, trillion, mixed cut, which measures 6.15x6.15x3.85mm, eye flawless, VS type2 from the gem fields of Ratnapura, Sri Lanka. Trillion shapes have that magical and mystical eye appeal that is simply irresistible. This one is no exception, full of shimmer and lustrous presence. Many ways to set in, in a ring or a fancy pendant, let us create something beautiful for you. Or even loose, add it to your collection of unheated sapphires...worth every penny of it...super low price! And we can set it for you too. 2.0 cts. 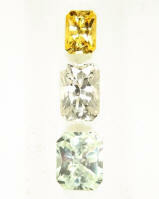 total weight of unheated, Ceylon "fancy" sapphires, with the main three gems being yellow sapphires, from 4.3mm to 5.7mm the biggest, and graduating in color too from pale yellow to rich yellow the biggest. Then the baguettes pink and blue 4x2mm. In all the stones the cutting is excellent (as with all of our stones...we care about cutting!) , clarity is eye flawless, VVS type2 and they originate from the gem fields of Ratnapura, Sri Lanka. Well, we have ready a beautiful design for this one....Price is excellent for this set, and have it set in a custom made Journey pendant...we will guarantee you a unique jewel! Very delightful, rarest, unheated, Ceylon "padparadscha" sapphire. Great size...clean... beautiful. We have been lucky enough to acquire a parcel of unheated Padparadscha sapphires from Sri Lanka at exceptional prices. And let me tell you, these gems have undergone a tremendous journey to arrive to us. And offered to you as mother nature created them millions of years ago, no treatment whatsoever. 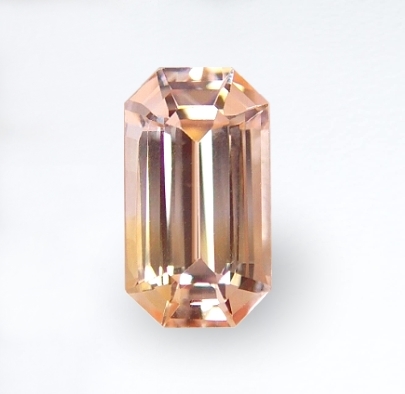 This one weights 1.64 ct., pastel, pinkish orange color, well executed, elongated oval, mixed cut, measuring 7.27x4.73x5mm, eye flawless, VVS1 from the Ratnapura gem fields, Sri Lanka. Beautiful one. The rarest one. For someone who likes a slightly elongated oval. Color is exotic. A give away! Captivating & exotic, unheated, color shift, "orchid" color, Ceylon sapphire. Lovely! Very rare colored, unheated, Ceylon sapphire. 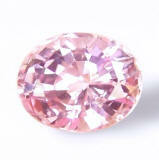 One-of-a-kind, Ceylon sapphire, weighting 1.40 ct., medium, unique, pink-violet color with orangish undertones in daylight, shifting to pink color with orangish tones in incandescent light, excellent trillion, mixed cut, measures 6.6x7.9mm, eye flawless, VVS type2 from the gem fields of Elahera, Sri Lanka. A beautiful, unheated Ceylon sapphire with an unique charm and a bold cut. The color shift makes it a must have if you are looking for something different and very personal. Cutting and clarity are perfect. Overall, a real, rare find! And at true wholesale price ! 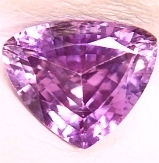 Alluring and magical, very rare, unheated, violet, color change, Ceylon sapphire. Simply gorgeous!